No party has the backing of more than 20 percent of voters, an unusual situation, according to analysts. The nationalist Finns Party has accelerated past the centre-right National Coalition Party to claim second place in a pre-election poll released by Yle on Thursday. With parliamentary elections due on Sunday, the Finns Party now have 16.3 percent voter support, up from 15.1 percent in a previous poll in late March. Thursday’s result represents a 1.2-percentage-point increase from last month and a six-percentage point rise from last autumn. Yle election analyst, parliamentary researcher Sami Borg from Tampere University, attributed the Finns Party’s voter approval boost to national discourse about sexual offences and immigration that ignited toward the end of last year. "With respect to the climate change debate, the Finns Party has also successfully offered a clear alternative and a different perspective compared to other parties. And [party leader Jussi] Halla-aho has also clearly run a successful campaign", Borg explained. 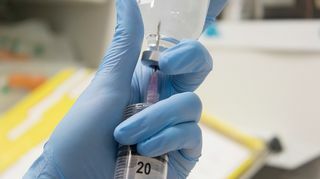 Research director Tuomo Turja of pollster Taloustutkimus said that the Finns Party has been able to attract many new supporters from the ranks of people who abstained from voting in the last general election. He said the party was also able entice voters who would have typically voted for the Centre Party, the National Coalition Party, and to some extent the poll-topping Social Democratic Party. While the SDP led by Antti Rinne has held on to the lead in the Yle poll for the entire year, it saw voter approval slip below the 20-percent mark to 19 percent, down 1.1-percentage-point from the late March survey. "It is often the case that the poll-leader’s margin narrows in the last survey," Turja noted, adding that the same happened to the Centre Party just before the last parliamentary election in 2015. The pollster noted that all of the changes in party popularity were well within the poll’s 2.3-percentage-point margin of error. The Finns Party’s pre-election surge has pushed the National Coalition Party into third place in voter approval, with 15.9 percent support. Prime Minister Juha Sipilä’s Centre Party remained in fourth place with 14.5 percent backing. The survey indicates that the race to become the country’s most popular political party continues to intensify, given the drop in support for the SDP to under 20 percent, the first time in more than a year that it has slipped below this boundary. The pollster said that it would be unusual for no party to corner more than 20 percent of ballots in the election. The closest similar situation occurred during the 2011 general election, when the NCP scraped together 20.4 percent of voter ballots. According to Borg, there doesn’t seem to be any ambiguity about the parties’ final order at the finish line, but the SDP will emerge as the winner of the election based on different metrics. "From the SDP’s perspective, what is essential is the lead over the other parties. The difference appears to be on the order of two to three percentage points, so the party appears to have a rather secure lead compared to previous elections since 2000," he added. However Turja from Taloustutkimus appeared reluctant to declare any election winners just yet. "Research shows that increasing numbers of voters take their decision about whom to vote for right down to the wire, even on voting day," he noted. "Regardless of who wins the election, it will be difficult to form a government with these numbers. At least second place is wide open, with two or three parties competing for it." In addition to the SDP, voters also cooled on the Left Alliance and the Greens in the latest survey. The Greens saw voter approval edge down 0.8-percentage-point to 12.2 percent. However, compared to the 2015 election, the current level of support is likely to give the party its best election outcome. 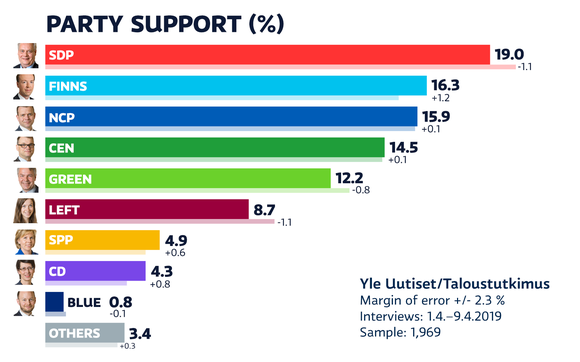 Meanwhile, support for the Left Alliance slid 1.1 percentage point to 8.7 percent in Yle’s fresh barometer. Turja pointed out that for the Finns Party and the Greens in particular the election result will depend on how well they are able to activate their supporters. Thursday’s poll also asked voters how certain they were about their choice of party. The survey included people who had already cast their ballots during advance voting, as well as others who said they planned to exercise their franchise. Respondents were interviewed during advance voting. "The Finns Party’s challenge is most certainly that of all the largest parties, they absolutely have the highest number of undecided voters. Their voting certainty is weaker than that of the other parties," Turja expanded. On the other hand, the poll indicated that Petteri Orpo’s NCP had the most unwavering voters. Among the smaller parties, the Swedish People’s Party saw a 0.6-percentage-point bump that took its backing to 4.9 percent, while the Christian Democrats experienced a similar blip to reach 4.3 percent. Among the major parliamentary groups, the Blue Reform trailed the field with 0.8 percent voter backing, down 0.1 percentage point from the last survey. Turja described the party’s election prospects as “very bad”. "The Blues' only chance is for one of their best-known candidates to be elected in the Uusimaa electoral district," he concluded.